They’re partners. They spend a lot of time together. Tim is idealistic and emotional. Frank is cerebral and cynical. Their temperaments clash, and in the day to day of life, they’ve been known to bicker. 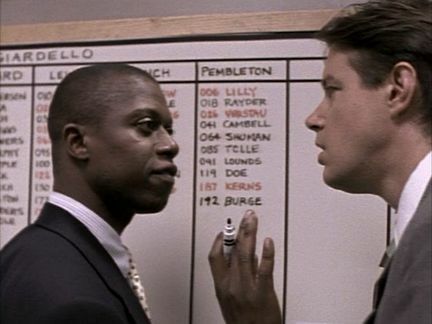 Maybe some of you will now recognize Frank and Tim, fictional Baltimore Detectives Pembleton and Bayliss, from the TV show Homicide: Life on the Street. It’s a funny little exchange that characterizes their relationship, but it’s also a representation of Frank’s philosophy. He doesn’t suffer fools gladly. And they are out in the world trying to solve the worst sorts of crimes, so why should it matter whether or not he is polite to Tim? Isn’t the subject of the argument idiotic? Human beings *can* excel at being idiotic. And I missed the step I should have known was there, and I came crashing down on the floor. I felt pretty simple, which is to say, unwise. It’s not that hard to watch where you’re going. But a propensity for accident is part of the human condition. We’re distracted and out-of-balance and overwhelmed by the demands of life, and the shiny things that loom in front of us, and the “need” to hurry, and even the coo of a baby in a Pack-and-Play. Maybe we can take some comfort in knowing that people have been this way forever: idiotic, misdirected, out-of-sync, uncoordinated and in need of guidance. It’s been suggested to me this week that I’m too hard on myself, but I certainly felt idiotic and embarrassed as I assessed the situation and picked myself up as quickly as possible, getting away before anyone else could see the damage. 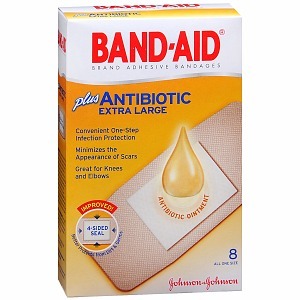 I came back to church and looked for the First Aid Kit in the kitchen, only to discover that we really need a new one. Then Lyn sent an email to the Trustees asking if they would replace it, and since George is a Trustee, the Blacks quickly figured that I was the patient in need. And since I know they know, well, here we all are no longer wondering why I’m wearing a specially purchased Band-Aid that fits on a knee. Turn into Wisdom’s House. The book of Proverbs personifies Wisdom as a feminine figure of power who partnered with God in Creation. * The Hebrew and Greek words for Wisdom and the Spirit of God were feminine; this is an ancient understanding lost when the Greek became Latin and the Spirit of God became masculine instead. She has built the place herself, carving the entrance from wood or stone. She is wise and accomplished in matters both discerning and practical. Wisdom prepares the table for those who need what she will serve; she oversees every detail of the meal and its presentation. Wisdom invites the simple, those without sense, to come and gain maturity and insight. And it fascinates me that it’s not a lecture hall in which the answers will be given, or the Temple or some other place of worship. It’s a house where a banquet will be served, where bread and wine will be shared. Wisdom comes through the senses, for those without the sense to watch where they are going. Frank is tough on Tim. He’s tough on everybody. He’s an educated Catholic, the product of Jesuit schools. He is well-read and widely knowledgeable. He is scarred by the world and defends his heart with his intellect. His retorts are smart, and he knows a lot, but he could use a dose of insight about the value of the living people around him, the people, like Tim, who care about him. We all know people who are smart but have no sense, don’t we? Yes, I recognize me. I haven’t always been wise. I’ve looked away from where I was headed toward the person I thought others wanted me to be, without enough thought for what God really had in mind or who God made me to be. Or which step I was about to miss. Frank is a homicide detective, and it is his job to look at terrible things and to solve horrible crimes. He is not just disappointed in people. Having seen the depraved way people harm each other, he is disappointed in the God who created them. We can blame God for letting us be free-wheeling … idiots. That seems to be part of the set-up, doesn’t it? We are here walking off steps while looking the other way, as if we didn’t have the sense God gave a goose. We do worse things, too. Frank wants God to do a better job keeping order, and I sometimes agree with him. We see the terrible things people do to each other, the rough handling and rude dismissals and thoughtless neglect and outright violence. But here’s what Frank, with all his learning, misses. He misses the invitation. And it’s for all of us. Because believe me, no matter how good our grades were once upon a time, no matter how we excel in our work, no matter how well we have developed our gifts and talents, we are all simple. And knowing how we are, God has not left us alone in the world. God came to us in Jesus. God remains with us in the Holy Spirit, at the table of Wisdom. We probably wouldn’t want to paint that on the church sign, nor would we buy an ad in the paper saying, “Those without sense, come eat our bread!” And churches are not always the ultimate in wise institutions. We don’t know everything, and we don’t get everything right, with each other or with the world. But the good news is that when we are misdirected, out-of-sync, uncoordinated and in need of guidance – even when we’re downright idiotic – and even when we’ve done wrong – we are welcome to turn in here. The doors are open. The coffee is hot. We’re all in the same situation, and some of us are even willing to admit it. Maybe we’ll even help each other get up again after a fall. So, please, don’t be an idiot. Thank you. Turn in here. Amen. *Many thanks to the Rev. Dr. Wil Gafney for her insight and scholarship on this passage at Working Preacher. Martha, this is a gem. Sorry you took the tumble. Glad you wrote the sermon. Grateful for the references to Homicide: Life on the Streets. Great sermon – I was rather ruefully smiling in several places at my own less than clever moves at times! !